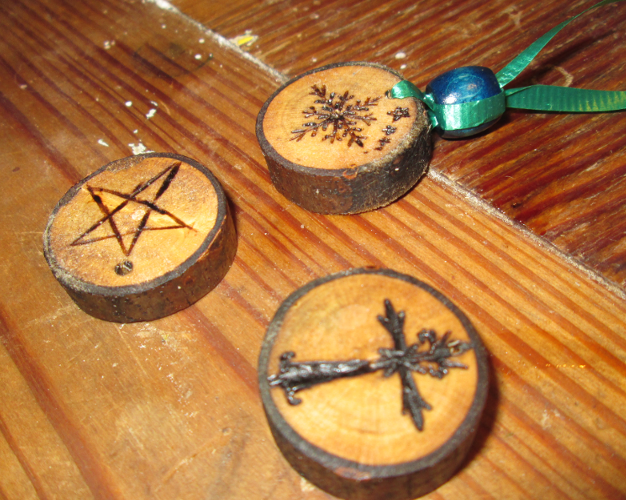 These ornaments or keychains (or however you want to use them) are extremely easy to make. You simply use a saw (I used my circular saw) to cut slices of a stick. Then you drill a tiny hole in the top, and burn in your design. When you’re done, slip a ribbon through, add and secure a wood bead (if you like) and tie it closed. You can see several different designs here. A star and a snowflake are simple and generic but they get more customized than that. One is a paintbrush and pencil crossed for an artist friend. One is a computer screen with YULE written on it in binary code for a friend who is a programmer. A third is an ornate cross and has a crown of thorns on the other side for a friend who is deeply Catholic (but celebrates my heathen holidays with me anyhow). There’ll be many more by the time I’m done. We usually have around 20-25 people over for Yule and each one receives a gift of some sort as a spiritual requirement for the holiday. That adds up, even if you only spend $10 per person. So we try to aim for home-made gifts as a frugal but thoughtful alternative. Plus it’s very in-tune with both the natural focus of the holiday and our desire to re-use and upcycle common items. 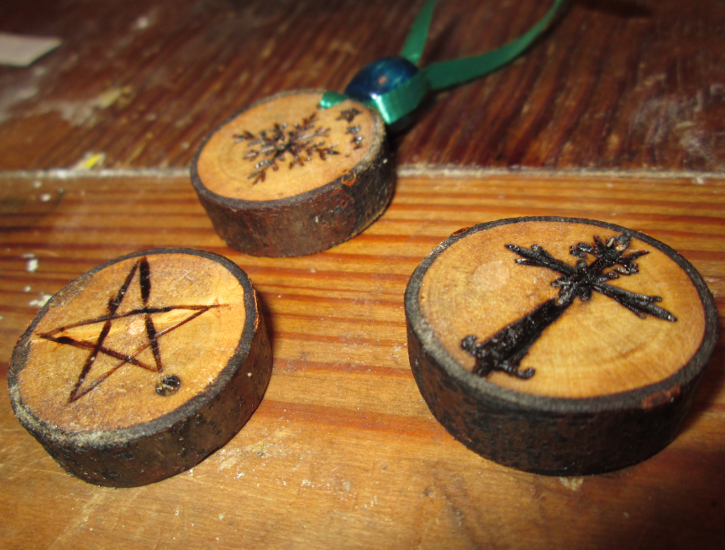 Here’s a step by step of how to make these neat little ornaments. First, find a stick that you want to use that’s straight and smooth. Some notes about the kind of stick you should use. The wood type isn’t really as relevant as the literal shape of the stick. You want to pick a stick that has a fairly consistent width and is as straight as possible with very few knots and knobs. Make sure it’s long enough to cut enough discs of the sizes you’d like with enough extra to hold safely while you’re cutting. You also need a stick that is VERY dry and has been stored indoors for some months. A wood that’s very dark in color will have less contrast then a wood that’s very light, especially if you choose to oil it. Next, pick a consistent width for your tokens and mark off one disc of wood. Cut and repeat until you have as many as you want to make. You can wing this but if consistency matters to you it pays to mark and cut carefully. Inconsistent cutting because I winged these means wild angles and different widths. Next, put your drill to work making a small hole in the top of each one. Be careful about your angles. If your drill goes between the wood and the bark, the bark will probably peel away. Note the red staining on the lower disc on the right. That came from the blade of the circular saw. It’s just a surface scuff and will be sanded off later. Bring your discs to a flat work surface and start to sand them. Sand both sides and lightly sand the bark edge as well. This makes the surfaces smooth and clean and nice to handle. it’ll also keep the wood from flaking. If you cut a piece wildly uneven (like I did), you can use the sandpaper to help even those out. Don’t over-sand the bark edges. You’re just trying to rub away some roughness, not take off layers of the bark. The whole piece of wood should feel almost soft. Now you’re ready to burn in some patterns. You’ll need a good wood burning kit. Choose a simple round pointed tip and set up your wood burner. I was using a Walnut Hollow kit, but there was a serious problem with it. The cord is extremely short, and it pulled itself off of the table onto the floor. One of the nibs broke and it snapped off inside of it. I have yet to restore the functionality of this wood burner. I had a backup, but in general, be very careful not to make my mistake. A wood burner is just a hot metal pen, so you can draw anything with it if you’re careful. I did lots of designs, you can get extremely creative. I did a bear, a cat, a fox, a computer, a cross, theater masks, stars, etc. Just draw it out with a pencil first and then burn it in… But right now I will be showing you how to burn in a simple but pretty snowflake. First, burn the ends of the hole open so they are clean and easy to work with. Then line up your straight bit of cardboard in the middle of the wood disc, across the hole to the bottom. I used a torn off tab from a box of cookies. Anything is fine as long as it’s straight and disposable. Burn a straight line from top to bottom, then do the same thing at a 90* angle so you have a big cross in the middle. At 45* angles from that, still using your straight edge, burn an X shape that’s about half the length inside it. Next, you simply start filling it out with the crystal structure. Whatever you do on one long line, do the same thing to all the others. They can be straight lines or at angles pointing outward or even X shapes, so long as they are symmetrical across all the long lines. On this one I went for pointed angles on the long branches, and then pointed angles on the ends of the short branches, with straight lines under it. A good rule of thumb is two branches on each line. I filled up some of the extra space with a moon and some stars. Stars generally have five points so a simple round, pointed nib can make a fuzzy star shape by simply burning five equally spaced points as tightly together as you can. At this point, I oiled all of the pieces I was doing. I used some tung oil that I had sitting around and an old scrap of towel to apply it. When you apply an oil like tung oil to the wood, it will dramatically change the base color of the wood. It will make it dark and rich, but it will also reduce the contrast. You may want to go over your wood burn again to make sure it comes out dark enough. When you are done oiling you may find some of the edges of the wood are a little flaky, especially if you have a large grain sandpaper. That’s OK. Just use the side of your wood burning pen to burn those edges down flat. You can see what the oil looks like on these various patterns as well, and you may notice some flaking on the edges. Note that the very center of the wood may absorb the oil differently than the rest of the wood disc. If this is very bothersome, gently and quickly burn over just the center to darken it just a bit. Now I’ll show you how I attached the bead. Start by deciding how low you want the ornament to hang, then double it (because the ribbon will be a loop). Then add an inch or two depending on the size of bead you’re using, and another couple inches for the knot on the top. These were a larger sized set of beads so about 2 inches would be right. I just guessed at a ribbon length, personally. Cut your ribbon and run it through the hole. You may have to fold it or use a needle threader or some such to make it go through if the hole is very small like mine were. String your bead over both ends of the ribbon. Part the ends of the ribbon down over the top of the bead, then bring them up through the bottom of the bead again one at a time so they form loops on opposite sides. Then simply tighten the loops with the beads close to the wood disc and it will hold very securely. Tie a knot at the top and you’re done! Let them sit for a time to absorb the oils, but at this point your gift is done. Cute, pretty and simple. Possibly most importantly, nearly free (if you don’t completely break your wood burning tool in the process). I hope you enjoy crafting these! What if you make a mistake!? If it’s a deep enough burn, you should probably just start over with a new disc. I mean, these are made out of sticks from your wood pile, after all. But if you have a light burn or don’t want to make a new disc you can actually just sand the burns out. It may take a while to actually get through the burn marks, but any blemishes on the surface of the wood can simply be sanded out with a little elbow grease and then re-oiled. Happy crafting, friends! Until next time!